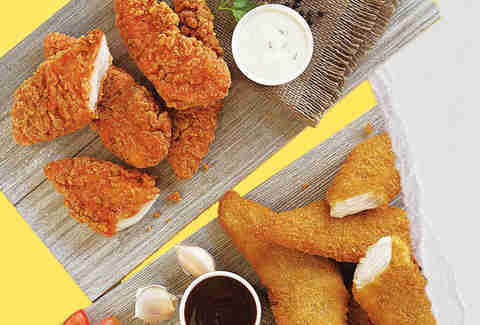 Since the dawn of fast-food, nuggets have reigned supreme as the bite-sized, battered, deep-fried poultry of choice. For reasons only known to the ghost Mayor McCheese, tenders have been slow to enter the brown paper bag of fast-fooddom. But of late, the humble chicken tender has seen its profile rise, bursting out of the plastic baskets of dive bars and entering the drive-thru mainstream. At this point, 14 major American fast-food chains have thrown their fingers in the ring. But which one is best? To find out, we set off on a quest to get them all, ranking them based on their tenderness, breading, seasoning, and overall deliciousness (dipping sauces were considered extra credit). 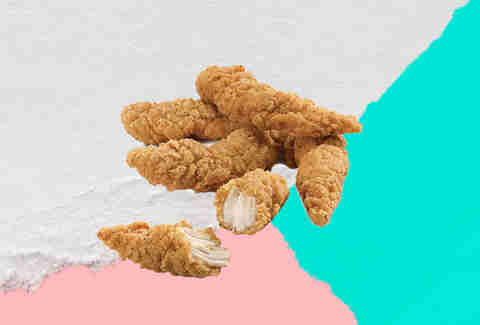 Without further ado, here is every major fast-food chicken tender, ranked. 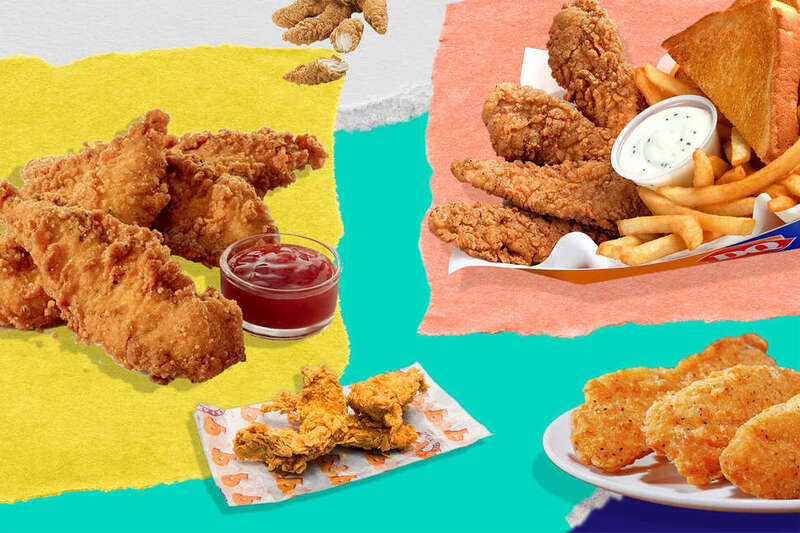 BK gives you plenty of options to get your finger fix: chicken fries, chicken nuggets, and chicken tenders, which are the King's newest offering. They come in two-piece and four-piece, and we're going to strongly recommend getting four if you like chicken, largely because there's barely any hidden underneath the massive amounts of breading. So. Much. Breading. There’s a seasoning on the tender that appears to be aiming for an enhanced, peppery flavor, but comes across as an extra heaping of salt. The seasoning sadly lingers like a bored high school student loitering in front of a Burger King. Stick with the chicken fries. 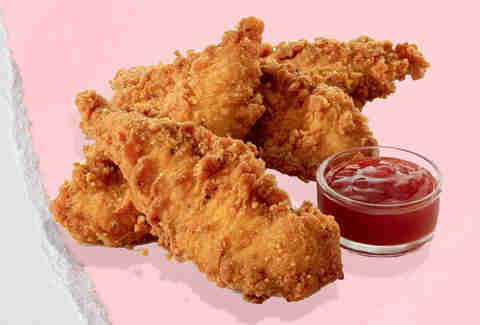 The tenders are gigantic and flat, and one of them was in the shape of a comically fake chicken wing. 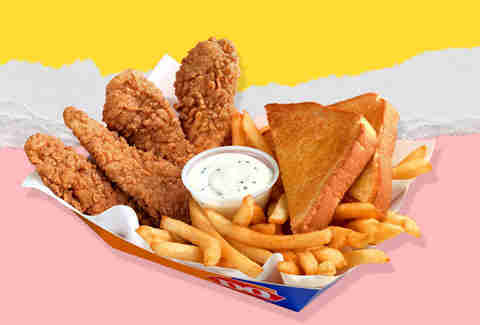 The tender itself is about 70% breading, 30% chicken. No discernible seasoning in the batter. The chicken is tasteless. Wendy’s, ya done goofed. How can you not love Sonic? Beyond the millions of drink options (the company says there are 1,063,953 drink + slush combos) and the legit food and dessert, it’s fun to sit in a car parked at an angle and pretend like you’re at a carhop in the ‘50s. That’s why this chicken tender experience is such a bummer. Don’t get us wrong: the Sonic burger and chicken sandwich are some of our favorites in fast food. But the chicken here came out dry. There’s no crunch from the breading upon biting into it, and no noticeable seasoning. 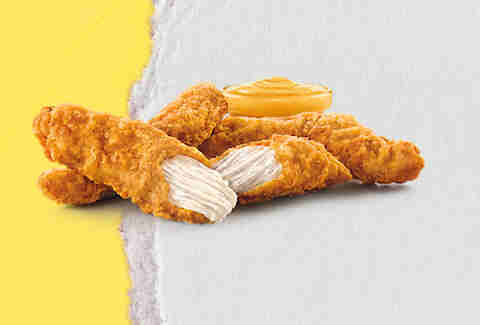 The new Signature Sauce for the tenders tastes like a tomato-based honey mustard. Stick with its regular honey mustard, if you must dip. And you must. Trust us. The seasoning is 25% better than Wendy’s. This is pretty much because there IS a seasoning. It’s just pepper, essentially. The semi-chewy chicken is whatever. The one-step-above-rubbery crunch is whatever. Everything about these are whatever. There’s no reason that fast food burger spots should be making better chicken than any restaurant with the word “chicken” in the name. Yet here we have Kentucky Fried Chicken, slinging less-tasty chicken tenders than McDonald’s. The chicken is shockingly bland. Admittedly, they have the batter-to-chicken ratio just right. 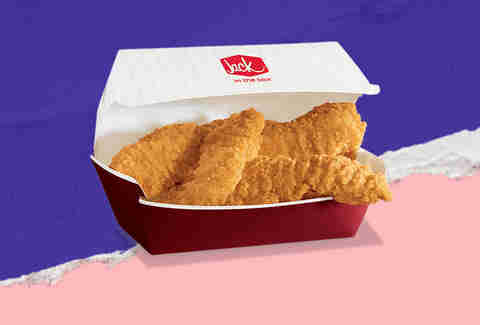 The Original Recipe-st crunch is very solid and gives way to the hot and steamy chicken inside, but said chicken is just so BORING. When your chicken finger comes out of the fryer hotter than (the inside of an oven set to broil in) Hades, expect the first bite to be shockingly good. The tender’s crispy and not at all greasy. It tastes like a premium offering at a chain like T.G.I. Friday’s. That’s a compliment. 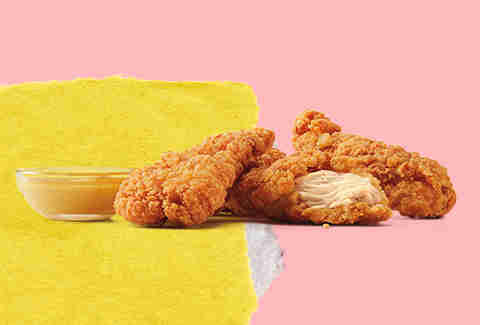 The BBQ and honey mustard dipping sauces are standard fast food fare, but if you wanna really party, get the tenders served with a side of gravy. As far as their claim that the tenders taste like buttermilk: nah. Hell nah. No buttermilk flavors to be found anywhere. HOWEVER. The batter is above average. A wonderful, slightly spicy crunch — without any sort of gristle -- encases chicken you can actually bite in half easily. A true shock to the system here. Well done, McDonald’s. Well done. Arby's deserves a little bit of credit for being well, well ahead of the curve in offering tenders: Back when most chains were still figuring out how to press a nugget, Arby's was offering up the kind of chicken tenders that reminded eaters of ordering them at bars. The tenders have barely changed: They're still salty. The batter's still thick and sometimes hard. And the meat still peels away in strings, just like a real chicken tender should. That they're not at the top is less a condemnation of what they are than a testament to how far tenders have come. Arby's set the bar. Then they didn't move it. Which is cool. They still taste good on the Meat Mountain. Basically Popeye’s, but not nearly as well seasoned. Still, if you're gonna taste almost exactly like something, it might as well be Popeyes. 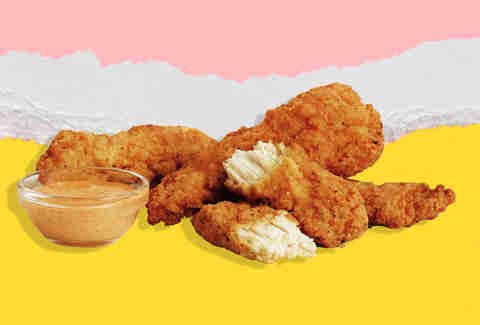 Chick-fil-A has always been pretty overrated, but when it comes to all the less-than-spectacular tenders that other companies are serving up, there’s no question it belongs toward the top. The chicken has actual flavor — that sort of peppery goodness that reminds you of southern-style fried chicken. A bite of Chick-fil-A practically demands a side of biscuits and gravy. The batter is just light enough that it enhances the flavor of the chicken (which tastes like, ya know, actual chicken). Dipping sauce does not factor into this ranking, but a special shout out to the Chick-fil-A sauce. It’s money. Lack of apostrophe aside, Popeyes is an unabashed fried chicken behemoth. Not only is the chicken impressive for fast food, it’s impressive for chicken. The cajun flavors benefit the flaky batter in a big way, and the chicken itself was full of flavor. It truly reminds you of a soul food restaurant in the best possible way; you’ll be heavily rewarded with the addition of some Louisiana hot sauce (and it’s of course complemented by all of the unique sides Popeyes offers, like jambalaya and red beans & rice). When you pull the tender apart with your hands, it actually breaks in half easily, as opposed to most other tenders where you just end up just sliding the entire chicken out from the plastic-y breading. Plain, spicy, you name it, they are nailing it all across the board. A phenomenal tender. Popeyes is death from above. Like Popeyes, Raising Cane’s started in Louisiana with the intent of giving the finger to nuggets (see what we did there?!). They’ve succeeded in a huge way, busting out of the south to more than 400 locations nationwide. 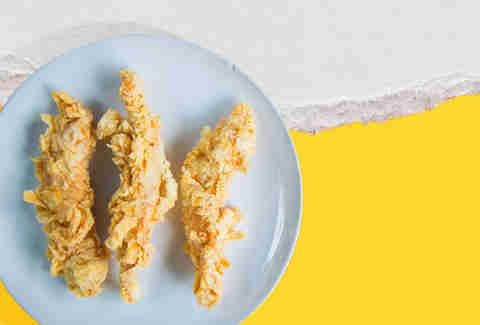 And while they’re lagging behind their Louisiana fried-chicken cousin in locations, they’ve managed to do the unthinkable: make a better chicken finger than Popeyes. We were just as surprised as you are. 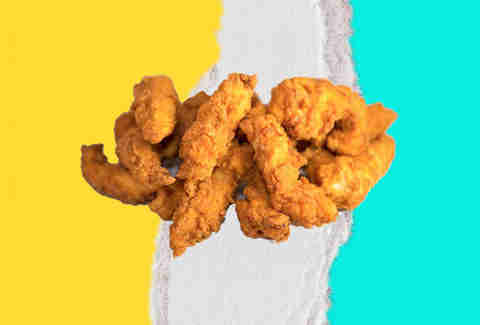 Raising Canes uses straight-up tenderloins for its fingers, which is the only thing on the menu that isn’t a crinkle-cut fry. That means each bite is impossibly tender, dripping clear, non-grease juices immediately after you crunch through the breading, which texturally lands somewhere in the middle ground between Church’s and Popeyes’ flaky exterior and the more batter-style thickness of Chick-fil-a. There’s not a ton of seasoning here, just a kick of salt and pepper. That's kind of the point. When the chicken is this fresh-tasting, juicy, and tender, the batter serves as a complement rather than a star or, worse, something covering up a lesser product. The chicken here is king. And among fast-food tenders, so too is Raising Cane’s.